4 (Yo) _________ levanto a las seis. 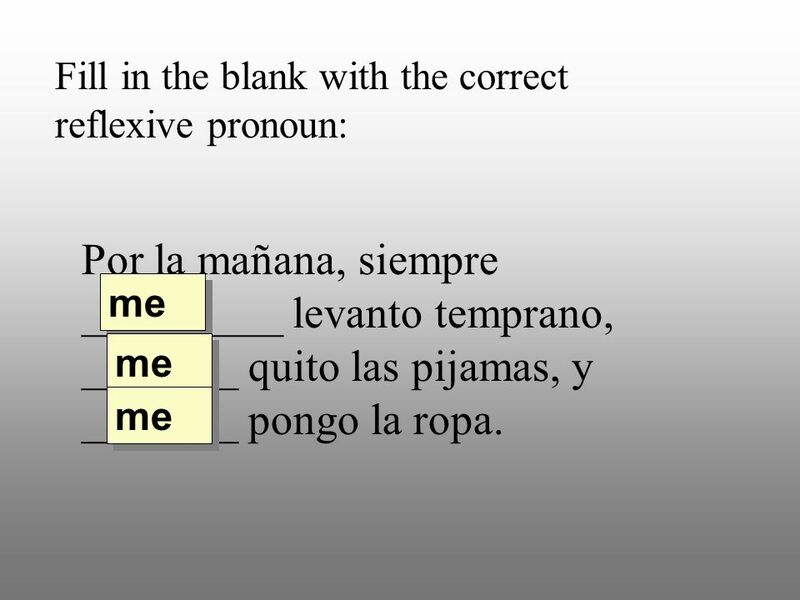 Fill in the blank with the correct reflexive pronoun: Me (Yo) _________ levanto a las seis. 5 (Nosotros) _________ acostamos a las diez y media.. Fill in the blank with the correct reflexive pronoun: nos (Nosotros) _________ acostamos a las diez y media..
6 Rogelio _________ lava los dientes. 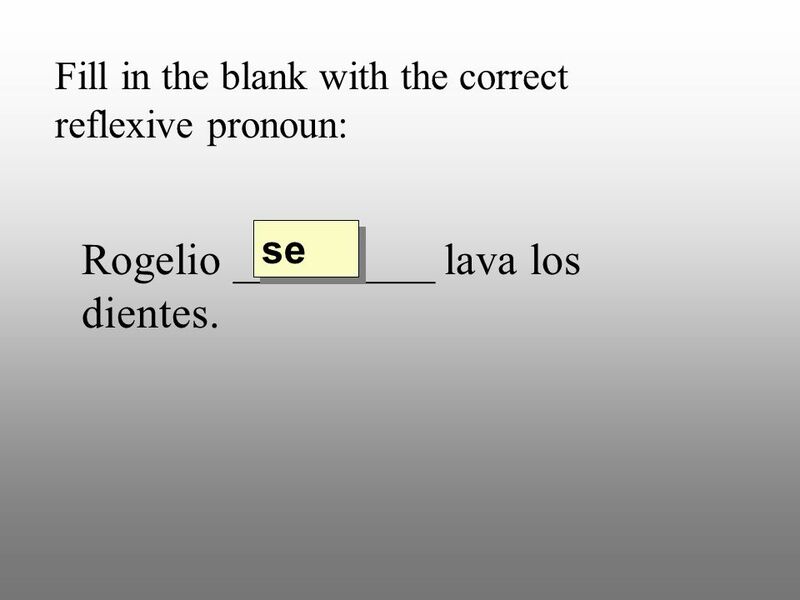 Fill in the blank with the correct reflexive pronoun: se Rogelio _________ lava los dientes. 7 Los niños _________ duermen inmediatemente. 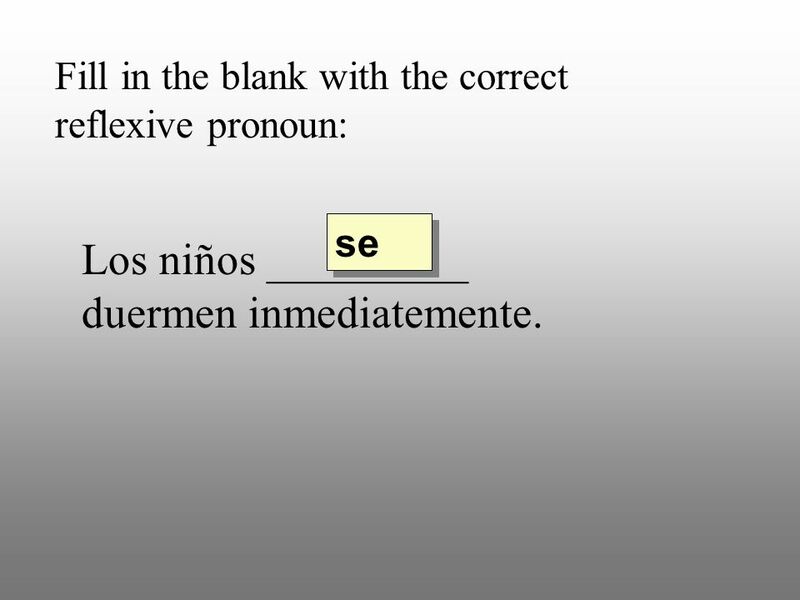 Fill in the blank with the correct reflexive pronoun: se Los niños _________ duermen inmediatemente. 8 (Tú) _________ despides a tus cuñados. 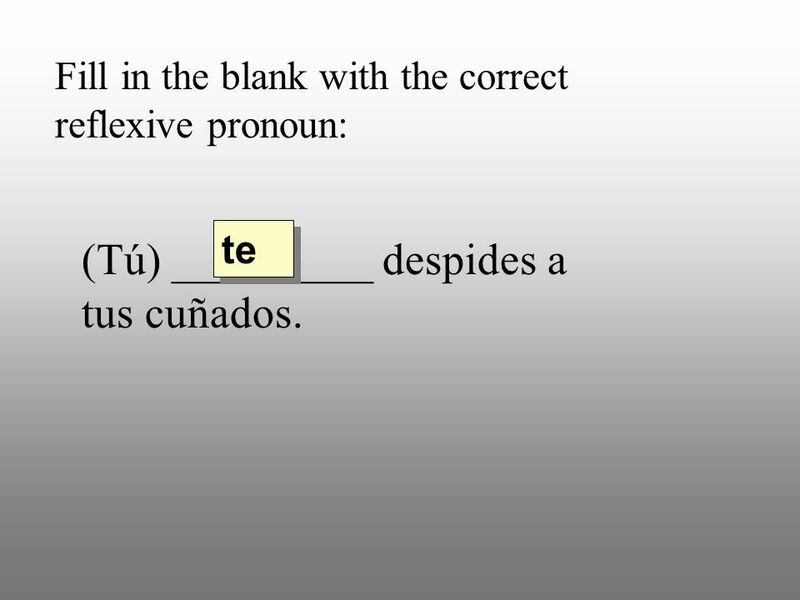 Fill in the blank with the correct reflexive pronoun: te (Tú) _________ despides a tus cuñados. 9 (Nosotros) _________ levantamos a las siete y diez. 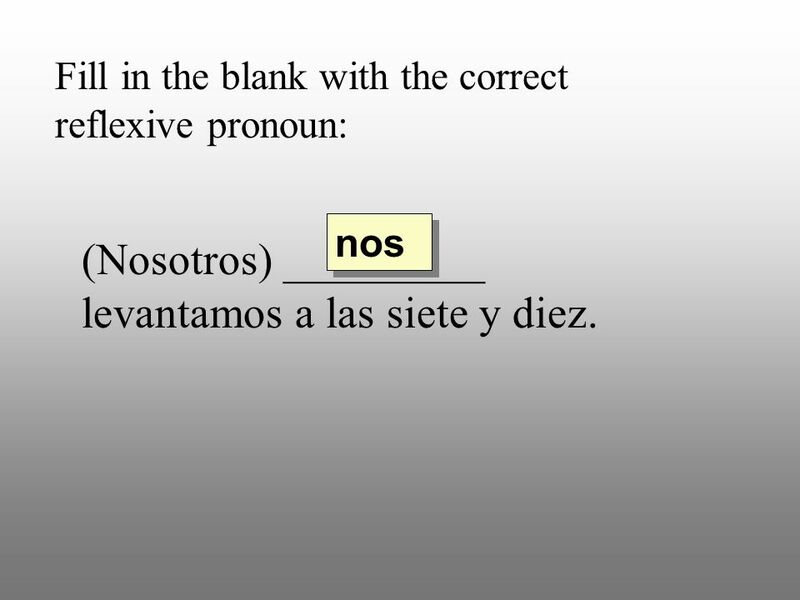 Fill in the blank with the correct reflexive pronoun: nos (Nosotros) _________ levantamos a las siete y diez. 10 Yo_________ enojo después del partido de basquetbol. 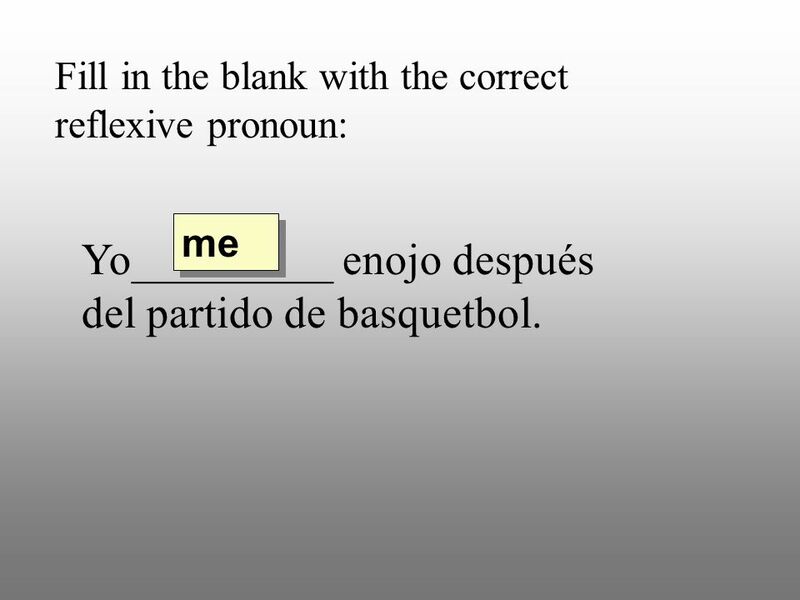 Fill in the blank with the correct reflexive pronoun: me Yo_________ enojo después del partido de basquetbol. 11 Mi papá _________ disculpa a mi madre. 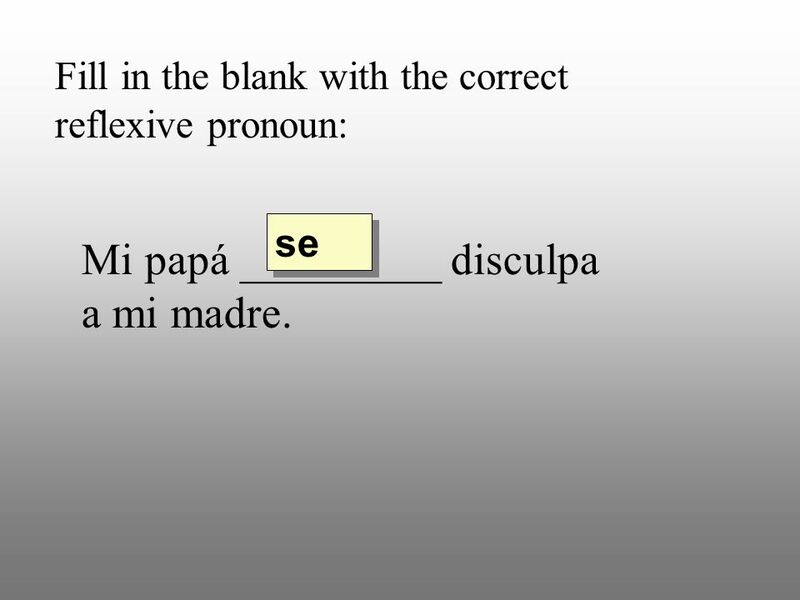 Fill in the blank with the correct reflexive pronoun: se Mi papá _________ disculpa a mi madre. 12 Mi mamá _________ pone el perfume antes de ir al restaurante. 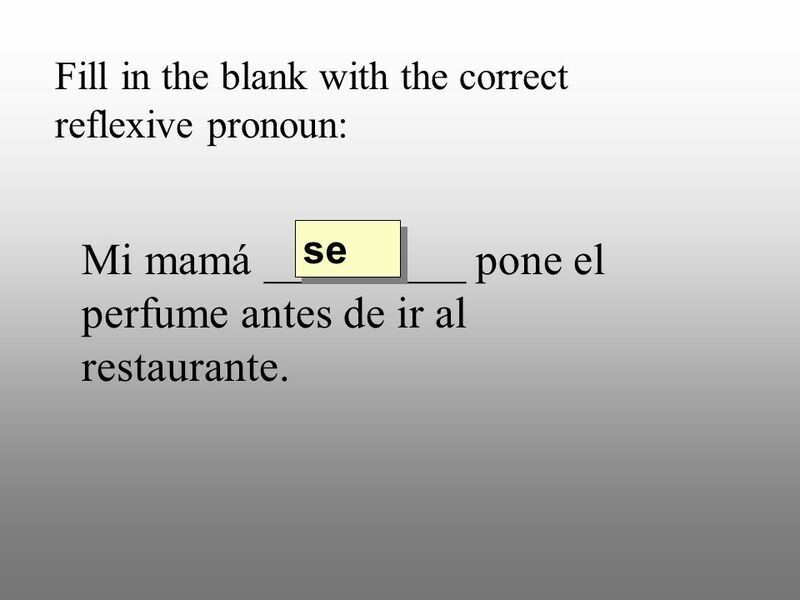 Fill in the blank with the correct reflexive pronoun: se Mi mamá _________ pone el perfume antes de ir al restaurante. 13 _________ aburro con la clase de historia. 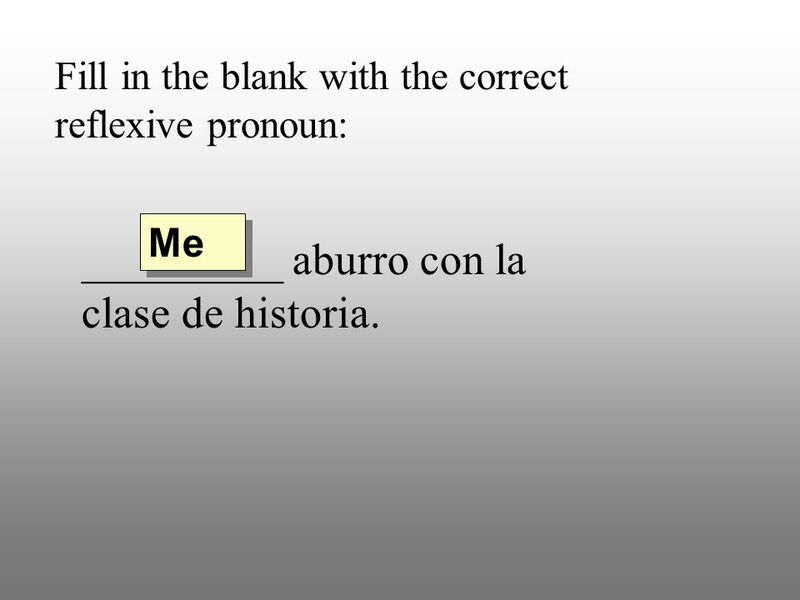 Fill in the blank with the correct reflexive pronoun: Me _________ aburro con la clase de historia. 14 _________ quito la ropa antes de ducharme. 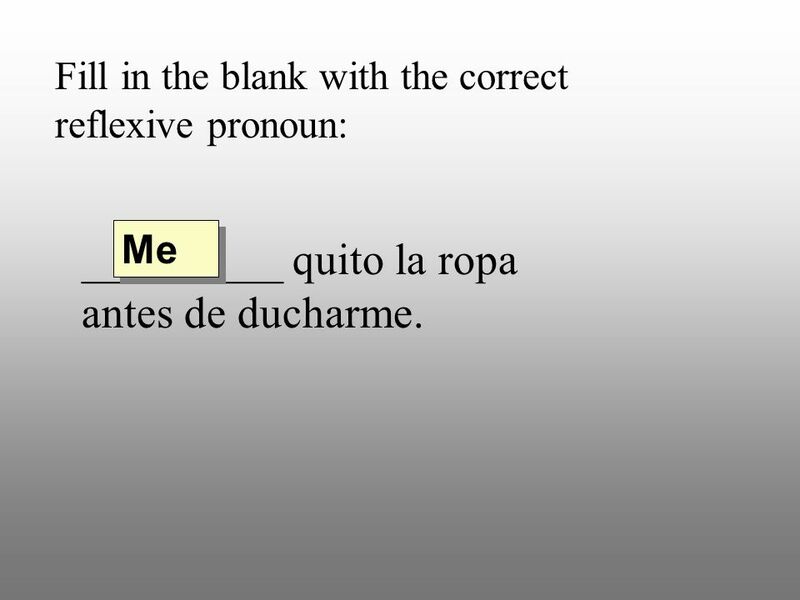 Fill in the blank with the correct reflexive pronoun: Me _________ quito la ropa antes de ducharme. 15 Beto _________ cansa de la clase. 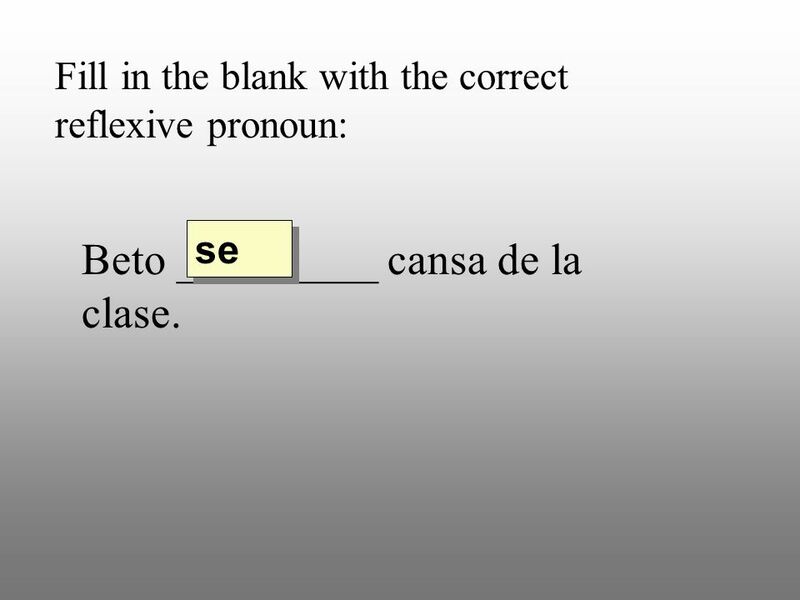 Fill in the blank with the correct reflexive pronoun: se Beto _________ cansa de la clase. 16 _________ lavas las manos antes de comer. 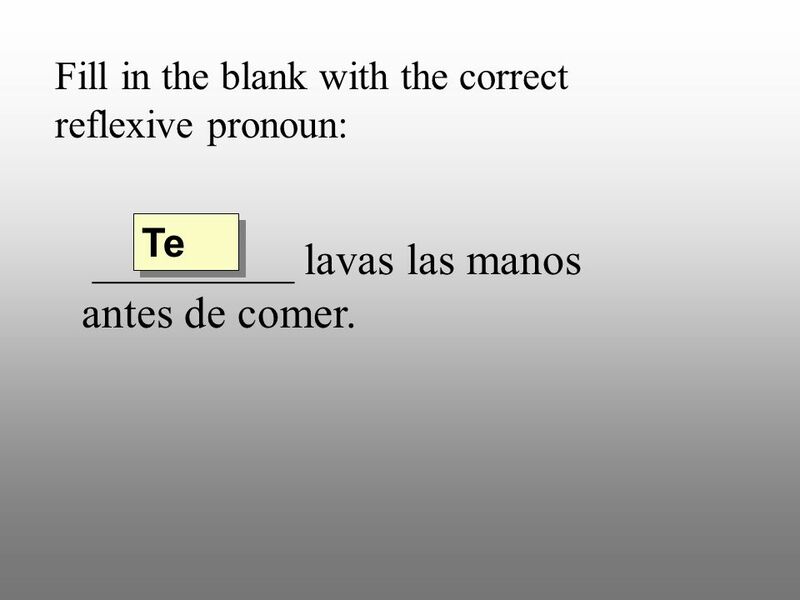 Fill in the blank with the correct reflexive pronoun: Te _________ lavas las manos antes de comer. 17 Mi hermana_________ porta bien pero mi hermano no porta bien. 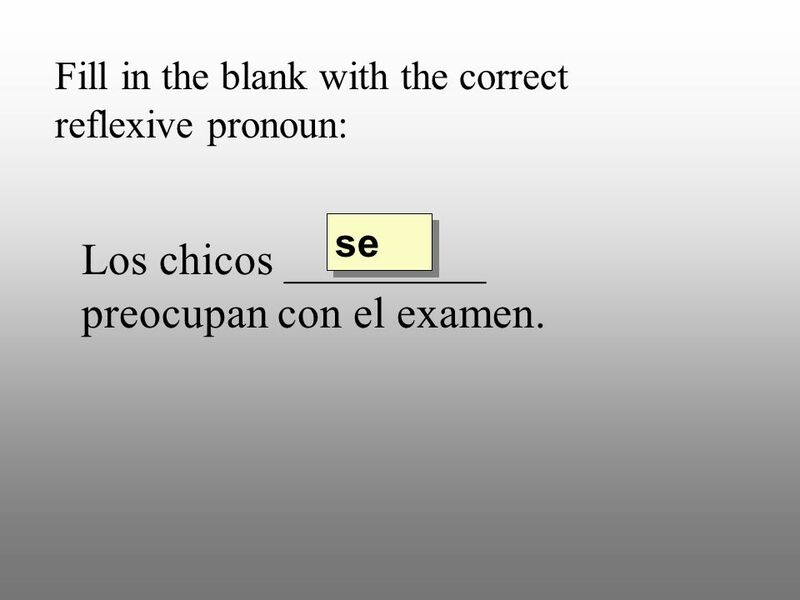 19 Los chicos _________ preocupan con el examen. 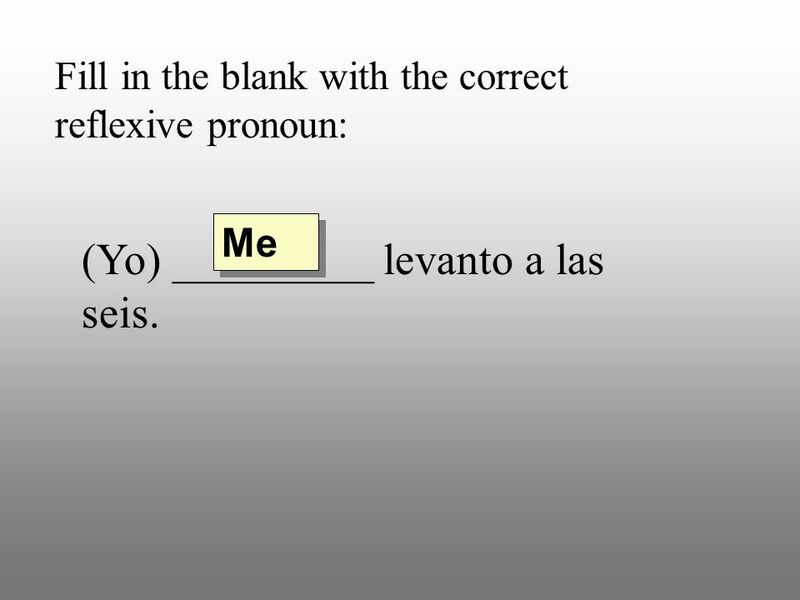 Fill in the blank with the correct reflexive pronoun: se Los chicos _________ preocupan con el examen. 20 (Nosotros) _________ enojamos con el Prof. Drost. 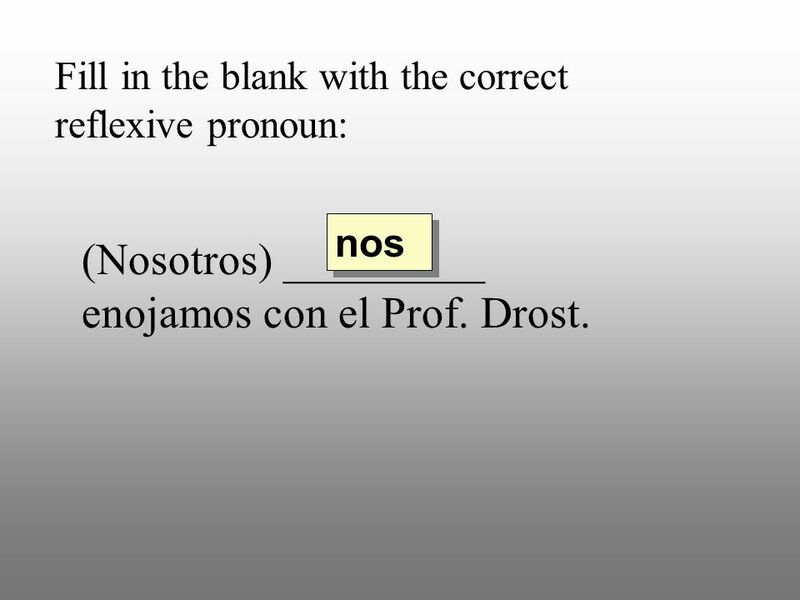 Fill in the blank with the correct reflexive pronoun: nos (Nosotros) _________ enojamos con el Prof. Drost. 21 ¿Cuándo _________ levantaste hoy? 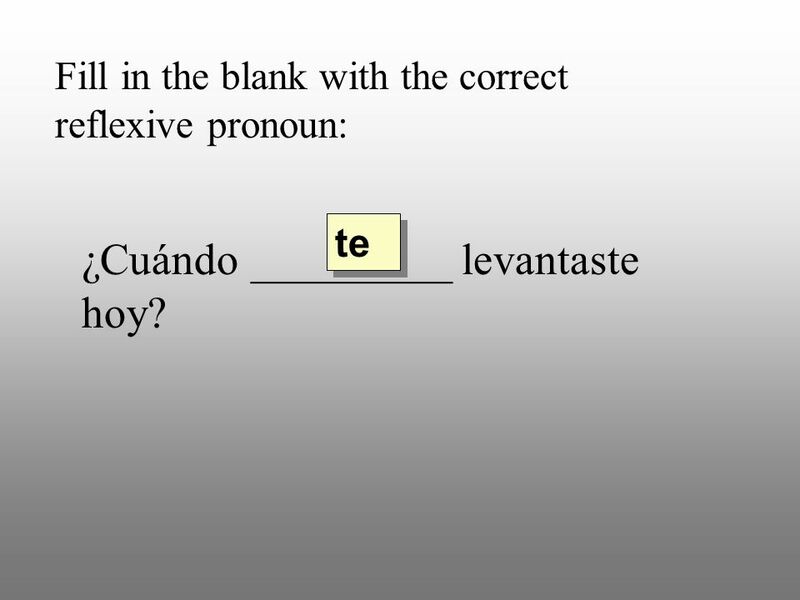 Fill in the blank with the correct reflexive pronoun: te ¿Cuándo _________ levantaste hoy? 22 ¿Cuándo _________ divertiste ayer? Fill in the blank with the correct reflexive pronoun: te ¿Cuándo _________ divertiste ayer? Descargar ppt "---- Levantarse temprano." Los Verbos Reflexivos en español…. 7/5 Escriban la forma correcta de ser o estar. 1.Yo _____ cansado.
. 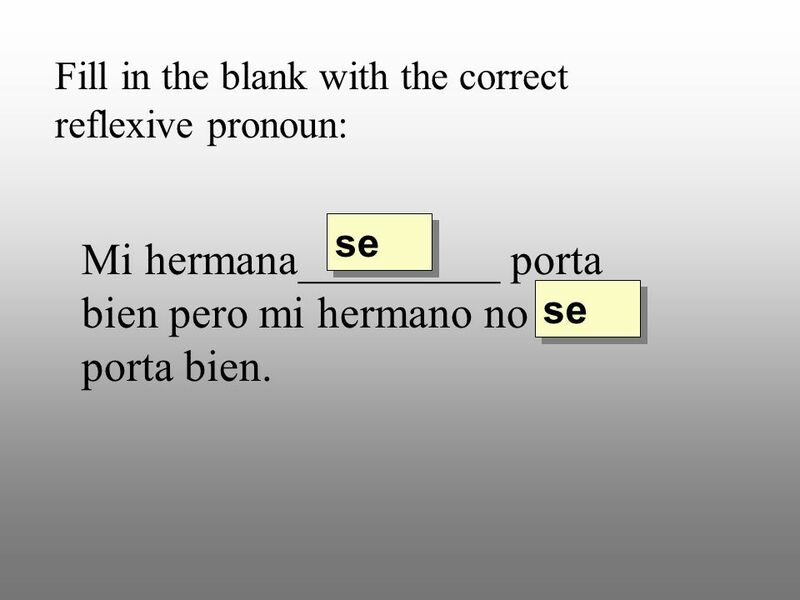 Fill in the blank with the correct form of the verb. 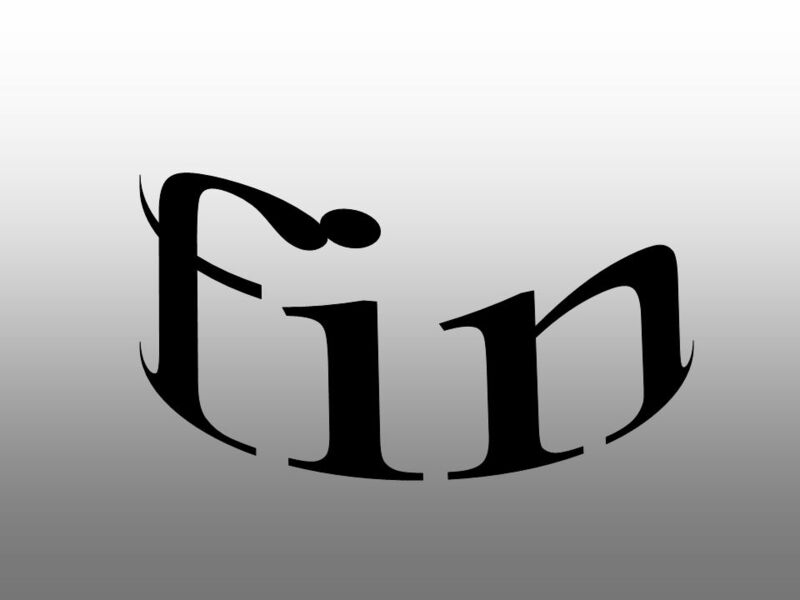 Be sure the verb has the appropriate ending. Los Verbos Reflexivos (Los Verbos Locos) para Jordan Cox Class of 2010. 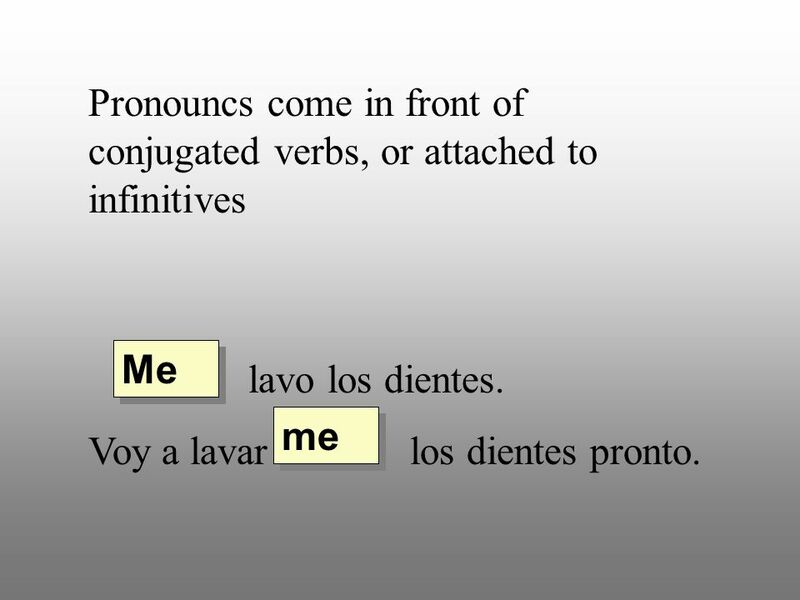 REFLEXIVE VERBS When are they used? When are they used? How are they formed? How are they formed? Elegirán una categoría. Serán ver la respuesta. Necesitarán dar la pregunta correcta. Pon un clic para empezar. Jeopardy. 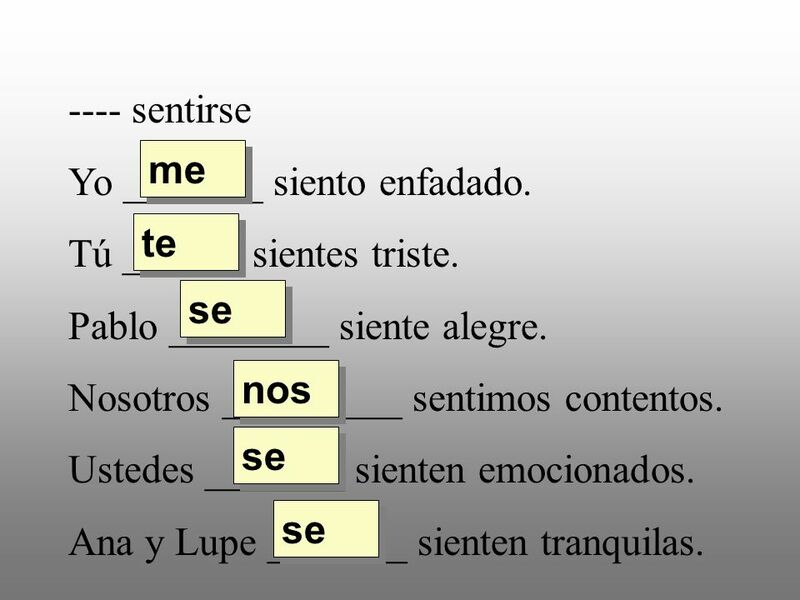 Los Verbos Reflexivos en español… Los Verbos Reflexivos In the reflexive construction, the subject is also the object A person does as well as receives. A reflexive verb is used to indicate that the subject does something to or for himself or herself. In other words, it reflects the action of the verb back. 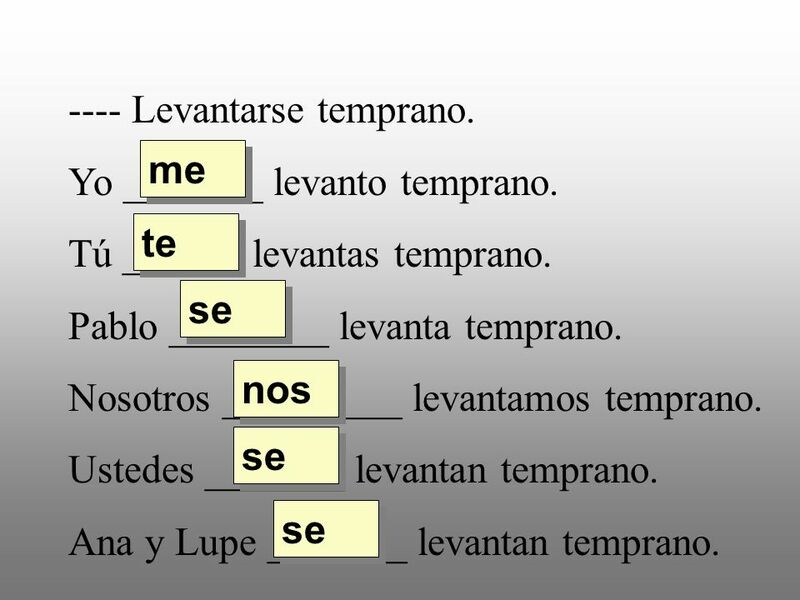 Español 2 – Lección 7 El vocabulario Los Verbos Reflexivos. The person that does the action also receives the action. ¡ A aprender los verbos reflexivos! Yo me peino. Tú te peinas. Él se peina. Nosotros nos peinamos. Los Verbos Reflexivos en español… #1. LA RUTINA DIARIA.  Los hermanos Juan y Pedro tienen rutinas muy diferentes. A Juan le gusta levantarse temprano*, pero a Pedro no. Pedro se levanta muy.